Women are playing an increasing role in science today but there are still barriers that can prevent them from achieving success comparable to their male colleagues. This feeds the argument that there is a gender pay gap in earnings in science, although that doesn’t tell the full story of the challenges facing women scientists. The Institute of Public Affairs senior researcher Mikayla Novak took the opportunity on International Women’s Day to exhort us to “avoid sensationalist, but misleading average pay gap statistics”, and instead focus on individual choices. Australian girls generally perform better than boys at school, but tend to prefer enrolling in humanities tertiary courses which subsequently pay relatively lower wages in employment, rather than the sciences, which offer higher career wages. But Novak is wrong to suggest that the sciences offer “higher career wages”. Postgraduates holding a degree in the sciences on average earn the same as graduates in other fields. The income range is significant among science graduates, as opposed to medicine/health professionals, management and commerce, or engineering graduates who are overwhelmingly in the higher income bracket. The graph (below) shows the income profile of postgraduates holding a degree in the sciences generally is about average relative to graduates in other fields. Weekly income of postgraduate degree holders in full time employment, by field of study, 2011. 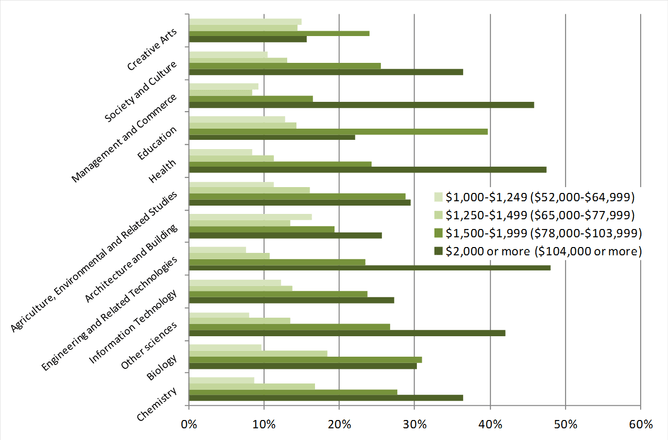 But the graph also shows that income is quite diverse among science graduates, as opposed to that among ,for example, Management and Commerce graduates who overwhelmingly are in the higher income bracket. 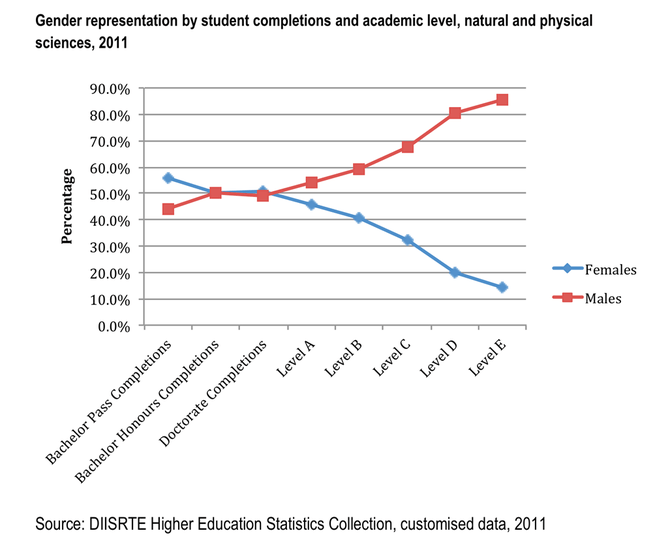 My 2009 report on Women in Science in Australia presents data on participation in higher education that graphically illustrates established patterns of low levels of participation in engineering and IT and low rates of retention and success in and beyond the post-doctoral phase for all other broad fields of science. 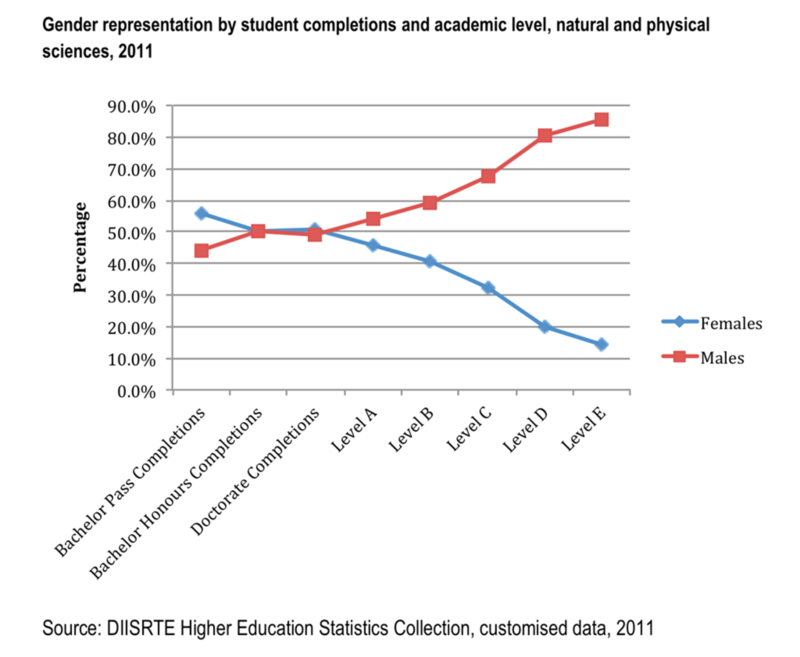 In 2007 women constituted more than 50% of Natural and Physical Sciences bachelor degree completions but less than 15% of level D and E academic staff (typically associate professor and professor levels). This pattern has been documented in Australia over the past 20 years, beginning with the Women in Science, Engineering and Technology Advisory Group (WISET) in 1995. To generate improved understanding of science careers and choices our most recent research on Women in the Science Research Workforce focuses on the career paths and career decisions of women and men in the very fields of science that have attracted women in significant numbers: the biological and chemical sciences. These two disciplines have experienced significant female participation up to the doctoral level for several decades. But sadly, despite the fact that outstanding women are increasingly seen achieving at the highest levels and taking key roles in the fields of science and technology, women’s participation in the science research workforce continues to be characterised by low-levels of retention and success beyond the post-doctoral career stage. The most recent data is graphically represented below, where Level A is entry level to an academic research career and level E is a professorial level appointment. See how the participation of women falls. Is this evidence of poor career choices? It is clear there is a significant difference between postgraduate aspirations and the reality of employment opportunities. The majority of postgraduate students in the fields of biology and chemistry aspire to secure academic and research roles within the academy and research institutes. When they commence their post-graduate studies they appear unaware of the realities of generational change in patterns of employment – an impossibly competitive research funding environment and pervasive casualised/fixed-term and insecure employment. This means that most research science graduates are now part of a freelance industry, for which they are unprepared. 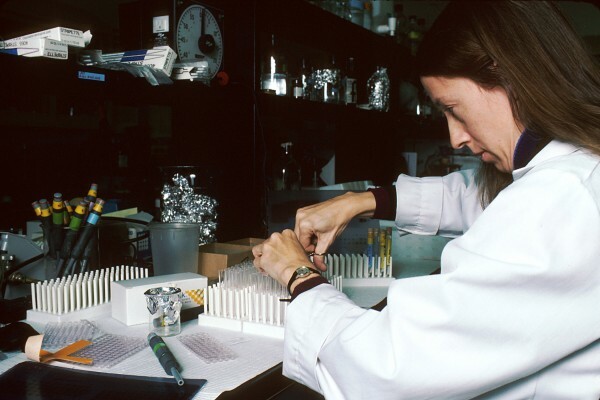 The manner in which most science research careers are currently constructed means that women hit the wall at the post-doctoral career stage and many branch into related fields in industry. In addition, among our 1,300 survey respondents, three times the number of women than men have taken significant periods of leave during the course of their careers. A significant number of women believe that this has affected their career progression. There are also income gaps between men and women who are employed full-time, especially pronounced in the higher income categories. Men reach higher income categories at a younger age and a small but stable proportion of women remain in the lower income categories for all ages. So who does succeed in science? Our research tells us that in addition to being meticulous and hard working opportunities exist for those who have – and have been supported and mentored to have – the confidence and optimism, self-assertion and bravado as well as the intellectual and technical ability to succeed in what some describe as a “tournament” but we think of as a marathon. This includes those whose life circumstances enable them to commit to cultures of long hours for “greedy” organisations, full-time employment, and the political skills and resilience to negotiate a highly competitive and insecure employment/funding environment over a career lifetime. Importantly, an intensive period of research productivity in the post-doctoral career stage – a critical stage for family formation for women – is key to establishing a career as an independent researcher. It is salutary to realise that philosopher Max Charlesworth and colleagues, in their 1980s study Life Among the Scientists on Melbourne’s Walter and Eliza Hall Institute of Medical Research (WEHI), captured a time when choices were more straightforward. The people who worked at the Institute formed two quite distinct social groups –- the scientists (primarily male) and the support staff (primarily female). The laboratory and animal technicians were recruited at the end of their secondary schooling -– bright young women, but not bright enough to have gained a place in a medical degree. These young women were believed to be “more tractable and more tolerant of routine than men” and “prepared to take a properly respectful attitude towards junior scientists”. But even for the best and brightest of these technical trainees (who were expected to develop the ability to carry out independent bench work) there were poor career prospects. The Institute did not expect its trainee technicians to make their career there. Today, much of the bench work and the long hours of laboratory science in universities and research institutes are the responsibility of doctoral students and post-docs. In the biological and chemical sciences most are women, and only some are lucky enough to be working at WEHI, where the gender agenda is being taken seriously. We would no longer assert that there is a choice to be scientists or have a family. Women are as competent and capable as men and should have the same opportunity to shape society and their own lives. But in reality, through the structure, funding and expectations of science research, we constantly reinforce a reality that is a gendered non-choice. Supporting women to fit the model of the “ideal scientist” is not the solution. We need to recognise and make sure that there are many ways for women and men to succeed in the marathon that is a science research career. Although the research tells us that scientists are motivated by their passion for their field of study this passion is sustained through adequate research funding, secure employment opportunities, equitable pay, and career pathways that enable mobility between the academy and industry. This month’s changes to the National Health and Medical Research Council (NHMRC)Administering Institution Policy reflect the need for more to be done to support women to achieve seniority. The required provisions outlined include an institutional strategy, mentoring and skills training, parental and carers leave and return to work provisions, remuneration equity, employment and retention strategies and child care support. These are welcome and necessary steps, but the bigger issue is can the very paradigm of how we do science research be changed to move from accommodation of women to a new paradigm that reflects the diversity of individual capacity and offers the opportunity for genuine life choices.